The Panasonic WV-SFV481 outdoor weatherproof i-PRO ULTRA 360 camera offers ultra high resolution, ultra sensitivity, ultra intelligence and ultra toughness. Built on Panasonic’s new, ground-breaking 12 megapixel 4K ULTRA HD engine, the Panasonic WV-SFV481 produces a 9MP (3K x 3K) Fisheye image at 15fps and a 4MP Fisheye image at 30fps to capture crisper edge-to-edge images that deliver virtually the same resolution and coverage area as four conventional 720p security cameras thereby increasing system efficiency The ULTRA 360° cameras’ new analytic functions optimize business processes by bringing a deeper understanding of a customer’s behavior. The new analytics are ideal for generating insight into floor behavior in retail environments and to evaluate people movement in public spaces. 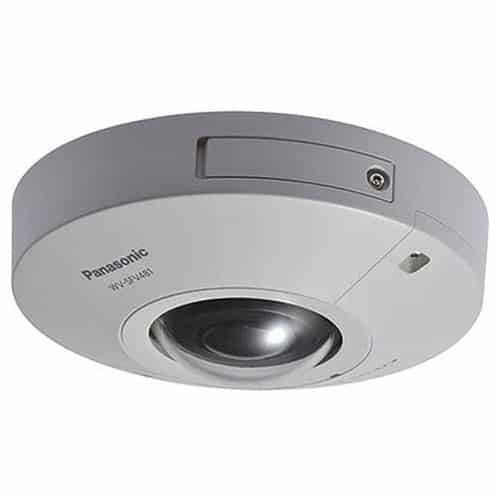 The Panasonic WV-SFV481 ULTRA 360 camera is designed to be highly flexible supporting various display modes such as Fish-eye, Single Panorama, Double Panorama, Single PTZ, Quad PTZ, and Quad Stream modes. 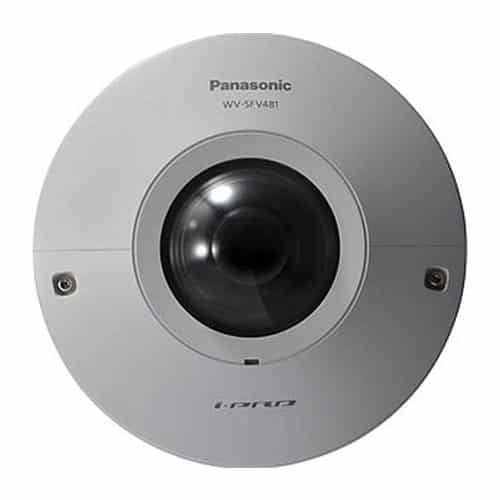 The Panasonic WV-SFV481 cameras support simultaneous streaming of both Fish-eye and dewarped images so that the system can allow the full image to be recorded while concurrent users can utilize additional streams with different display configurations. The cameras support multi-user virtual pan, tilt and zoom in Quad PTZ mode. This means that multiple users can pan, tilt and zoom different views of the full image at the same time on live streams or while playing back recorded video further increasing flexibility. The Panasonic WV-SFV481 cameras produce a 9MP 3K x 3K Fisheye image at 15fps and a 4MP Fisheye image at 30fps in H.264 for incredibly high resolution at standard frame rates, ensuring bright images under any lighting condition. In addition, the Ultra 4K HD engine allows multiple levels of zooming without resolution loss. 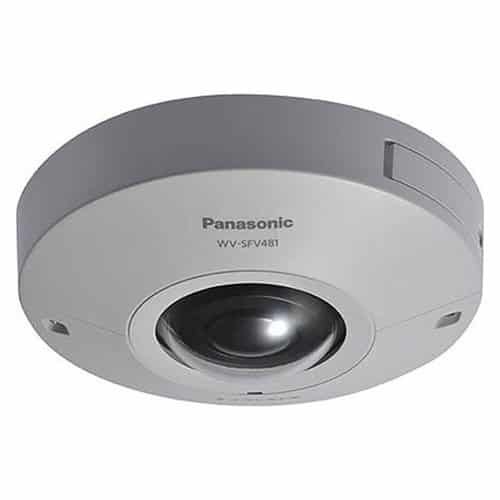 The Panasonic WV-SFV481 cameras’ new 1/2″ 12MP image sensor and F1.9 large diameter lens provides sharp and natural color reproduction with strong low light performance, less than 0.3 lux in color and black-and-white. 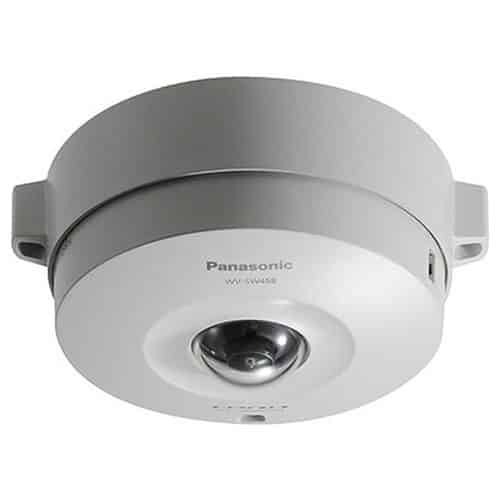 The Panasonic WV-SFV481 cameras feature an anti-shock vandal resistant chassis that meets IP66 standards for dust and water resistance and compliant with IK10/50J and are EN 50155 compliant for on-vehicle applications (SFV481 only). The ULTRA 360 cameras are ready for installation in vehicles such as buses and trains. 9 Megapixel images up to 15 fps. Built-in ABF enables automatic focus adjustment for sharp image both in color and B/W modes, and corrects the focus shift that caused by temperature difference. You can install the camera even in the environment having drastic changes in temperature. Angular field of view H: 180 deg. V: 180 deg.